Can you survive the harsh environment of Cerulean Vale in Aven Colony? Aven Colony is one of the most interesting city-builder types out there, throwing us on to the harsh lands of the alien planet Aven Prime, before being tasked with making the most of the lands found within. Now though there’s some DLC available for purchase – and the Cerulean Vale DLC will push your skills to the very limit. Available for purchase right now, Cerulean Vale brings an additional sandbox map to Aven Colony… and this is the most harsh environment yet. Coming in at a mere £2.39, those wishing to find reason to drop back in to the strange world of Aven Colony, then the Cerulean Vale DLC will provide it. Allowed the chance to discover the wonder of a brand new biome, this ancient seabed comes with more than a hint of blue and purple about it, with the lands tainted by the crushed micro-crystals of azurite. 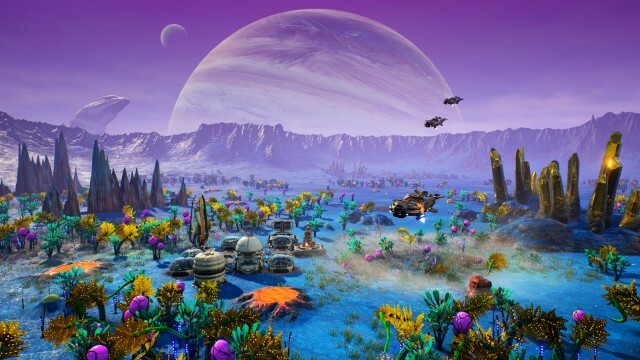 The usual Aven Colony ideas that we have come to know and love will be in place again with the Cerulean Vale DLC, letting you harness the rich lands under foot in order to keep your base and its population safe and well. Just be prepared to put up with some rather unique environmental obstacles that the world promises to deliver. The Xbox Store will give you access to the Cerulean Vale DLC for Aven Colony on Xbox One, and with the cheap price point, it’s well worth consideration. You’ll no doubt find the content available for the PS4 and PC versions of the game too. Should you wish to know more about the base game, then make sure you spend a little time with our review. Team17 rarely deliver bad games – and they certainly didn’t start with this one. Welcome to the treacherous badlands of Cerulean Vale. This additonal sandbox map features the harshest environment yet, and the greatest rewards. Push yourself to the limit of extrasolar survival! EXPLORE A STUNNING NEW BIOME: Discover the remenants of an ancient seabed, tinted blue by crushed micro-crystals of azurite. SURVIVE THE BADLANDS: Native Earth crops simply refuse to grow in this former ocean floor. Prepare to cultivate local plantlife to survive this hostile region. POWER UP YOUR COLONY: Produce remarkable levels of electricty by taking advantage of Aven Prime’s most generous deposits of Zorium. WEATHER THE STORM: Get ready for a region that features some of the most challenging weather conditions on the planet!